It is time for another CAS Colours & Sketches challenge. And, I have to admit, I’m a little nervous: I’m hostessing this month! I hope you like the challenges! Check out the latest challenge: #41 – colors (of course it would be rainbow 😉 ). I used a baby wipe to make a custom rainbow ink pad. To make sure I had ink in just the right amount of space, I first stamped my image on the baby wipe using a pale grey color. Then it was easy to put the refill ink exactly where I wanted it. I didn’t want to waste my baby wipe (though you can save the custom ink pads in a ziploc for a bit), so I decided to make another card. This time I dragged the inked baby wipe down my card stock. 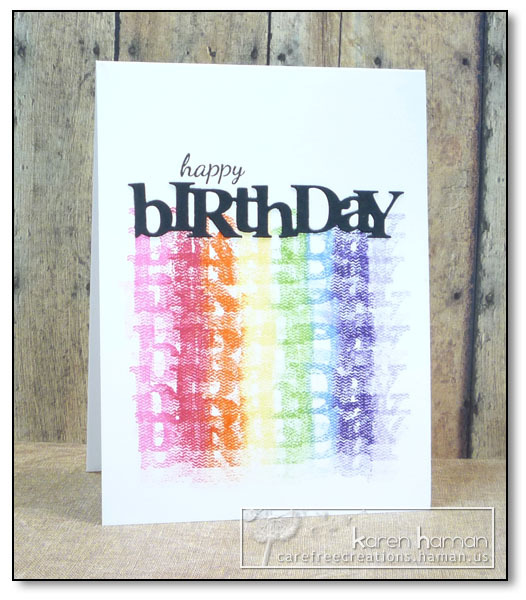 One thing I did on both cards was to die-cut the word birthday from white and use the “inside” pieces to help block out the background and make the text stand out more. A Little About the Challenge: Posted every Thursday, the challenges alternate between color and sketch (if there is a 5th week in the month you get the double dose of color & sketch). All supplies Papertrey Ink unless otherwise noted. 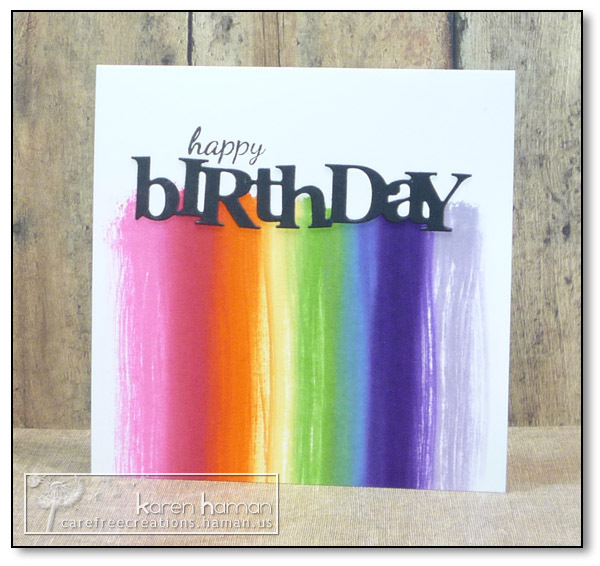 This entry was posted in cards, CAS Colours & Sketches DT, Papertrey Ink and tagged gender-neutral, mailable by karen h. Bookmark the permalink. Love these cards, Karen! Rainbows always make me smile. I love both of your rainbow cards. And how clever of you to replace the cutouts for definition. Two excellent CAS cards – but I have to admit I prefer the bold stripes on the second card to the repeated sentiment on the first. Piecing together the word “birthday” from white and black was a clever move (and would probably try my patience if I attempted it, LOL!). Great job, Karen! Great take on “rainbow” and fabulous technique. I love me some rainbow, especially with rainbows. These are both awesome!! Great technique!! Must give it a try soon!! So cool with this technique! Love how the rainbow turned out!